First off, sumimasen! Sorry! I screwed up. And in a pretty unforgivable way too. Last post I wrote that I didn’t quite remember everything I had planned to write before all this business with my dad went down and I don’t really apologize for that. It’s a blog, after all, which means I can do whatever I want. That being said, however, I did forget something rather remarkable… something in the bloody title: the movie “Space, Here We Come!”. It’s one thing to forget specific themes you wanted to write about, it’s one thing to forget what monsters to write about… but this was in the title, how the hell could I forget THAT!? 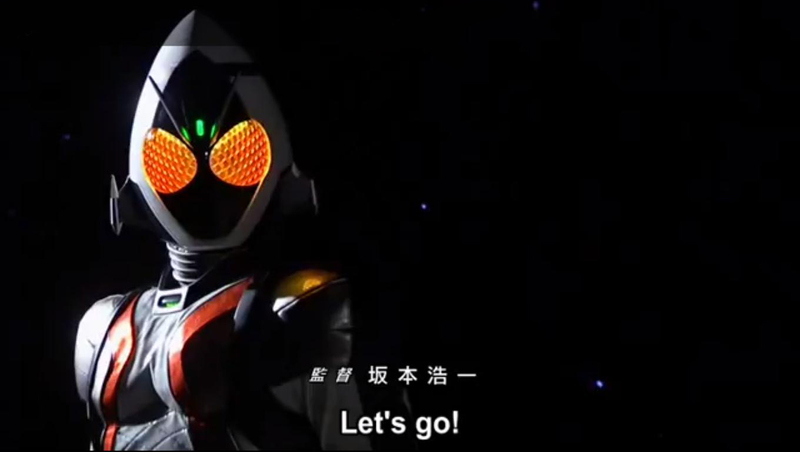 So before I get into my final thoughts on Kamen Rider Fourze to close that particular chapter of this blog, here’s a quick addendum to last post. Now, right off the bat I’ll be honest. I liked this movie. But I won’t be going into great details about it, for the most part, like every other tokusatsu movie ever, it’s more or less an extended episode with a slightly bigger budget for effects. The plot is simple, there’s a satellite in orbit equipped with an array of deadly weapons that’s been taken over by terrorists and the Kamen Rider Club are called upon to save the day. But when they come face to face with the terrorists, something appears off and they soon discover that there’s much more to this story than first assumed. 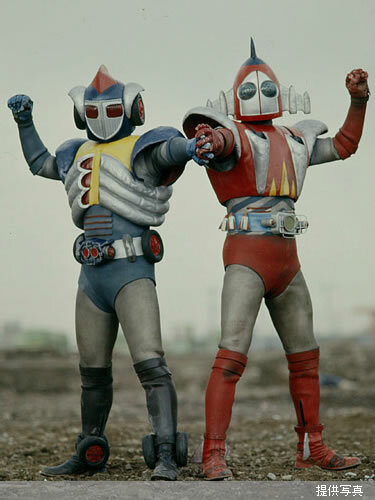 Fourze must join forces with unlikely allies in order to save the day but can he befriend them in time? For the most part, this appears like your typical Kamen Rider movie but there are a few things that it does that sets it apart from the rest. For one, there’s a surprising focus on unmorphed fights, not just for Gentaro and Ryusei but the Kamen Rider Club as a whole. Kengo naturally figured into the plot a fair bit but there’s a surprising amount of focus on Shun and Miu with JK and Yuki playing support. The final act had me surprisingly engaged for a movie like this but the inside of the satellite looks like it’s made out of concrete and pipes… aka, they shot this in a few basements and a garage which is all sorts of disappointing. Better location scouting is definitely called for. Yeah, yeah, laugh all you want, get it out of your system. My first instinct is to remind you that it’s from the seventies. But something tells me that doesn’t help. But to me, it’s appealing and VERY fascinating and since I’ll probably never see this series myself, just getting a glimpse of what it was like is enough to appease me greatly. They have taken some liberties to make it more modern, though. For one, in the original they were brothers whereas in this movie they’re brother and sister. And secondly… well, let’s just say there’s a big change but revealing it would sort of maybe spoil the plot entirely and we don’t want that because I know you’re all rushing to watch it right now. However, for those of you expecting them to give them the same treatment as they did Gavan in the Gokaiger movie, perish the thought for this has no connection with the ’76 series other than designs and names and is more simple curiosity than a full blown revival as was the case with Gavan. But perhaps in two years we’ll see the Kyodain 40 year anniversary? Yeah, one may dream, yes? If you’re really hungry for more Kyodain info than this movie gives you, check out the net movies that accompanied it because it goes a bit more in depth about the series. It’s the “Everyone! Let’s go to Class!” segment for those curious. So, overall, it was okay. 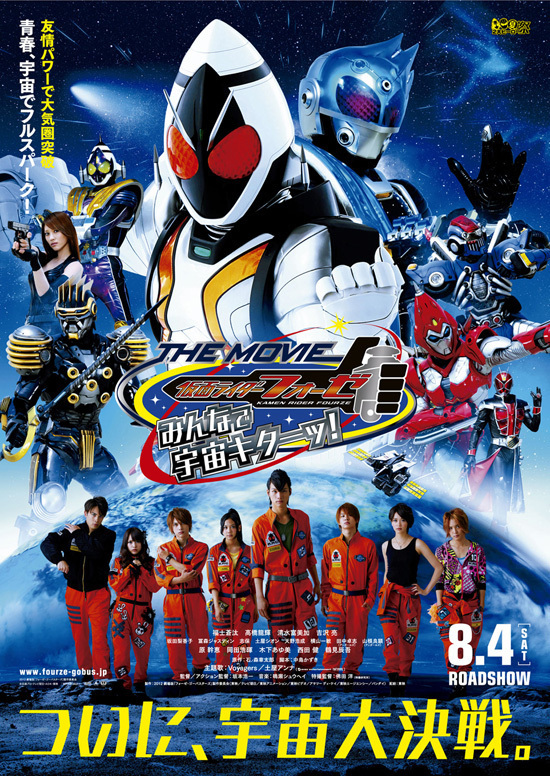 The Kyodain aspect is really what makes it interesting for me but it has above average “most things” for a tokusatsu movie (except for locations) so if you like Fourze, you’ll like this. Oh, and it’s the first appearance of Wizard… so there’s that too. So on to the main event. My final thoughts on Kamen Rider Fourze. I’m guessing the immediate question on everybody’s mind is “Did you like it?” and the answer is a solid yes. I mean, there’s no doubt about that. I genuinely think Fourze is a good show. That’s not to say it’s a flawless one though and the more time spent away from it, the more I come to see what I didn’t particularly like. For one, while the villains did grow into something interesting, it takes FAR too long for them to get there. Early on there’s a big, big focus on the characters that would eventually end up being the Kamen Rider Club and the monsters were more background noise than anything, there to help Gentaro meet these people. But once that period ends, there’s nothing there to take its place and we’re left with some serious downtime where we’re mostly treading water while waiting for the serious threats to show up. And once they do, it’s pretty much straight down the highway to the ending. But like I said in my very first Fourze report, I really enjoy the school setting and it’s surprising how well it works since I normally don’t care much for high school drama. However, perhaps it is because I finished university not long ago or some growing sense of nostalgia for school or perhaps it’s just this series in itself, the high school drama was captivating and I could honestly see the talented writing at work here. It really is the supporting cast that carry the series and make it stand out and it doesn’t take long for them to be almost more interesting than the “main characters”, if one can use that term here. I suppose that’s the biggest complaint otherwise: Gentaro, Kengo and Yuki, the three first, are… quite frankly forgettable in the long run. Gentaro doesn’t develop in the slightest over the series despite there being ample opportunity for it, such as exploring the effect his parents dying had on him. 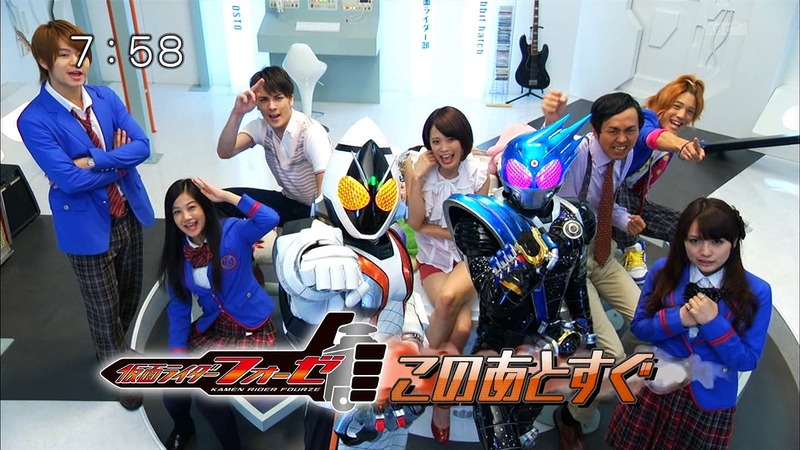 Kengo is the main support for Fourze but doesn’t really do anything plot related until the end and while he ties into the major plot, it is a bit out of left field and not nearly as interesting as it could’ve been. And Yuki… well, she’s Yuki and I don’t like her much. Instead it’s really Shun, Miu, JK and Tomoko that get the most development, all eagerly embracing their stereotypical cliques at first before slowly opening up to reveal their insecurities, dreams and fears. And it’s real shame that Chuta Ohsugi, the teacher that ends up joining the Kamen Rider Club, never really gets to be part of the plot but continues to work as a comic relief. But I shouldn’t paint the comic relief too poorly because one of the series’ strongest points is exactly that, it’s humor. It’s the one time Sota Fukushi’s, man playing Gentaro Kisaragi, acting hits all the right notes and he is perfect for the role of the naive yet lovable buffoon that he is. Sure, some comic relief works better than other, Yuki… well, I don’t like her or her antics and Chuta Ohsugi, while funny is also… INCREDIBLY creepy and he’s the kind of character you expect to be caught sniffing someone’s chair. But the humor goes hand in hand with the naivety the series clings to and while there are no deep, philosophical jokes to be found the jokes, the pranks and goofy misunderstandings all… well, they just work. Another thing I wholly liked about this series was the music. Everything from the opening to the licensed songs to the original soundtrack works beautifully and it’s been playing hot on my playlist ever since I got my hands on it. Like much of the show itself, it oozes 80s and 90s Americana with lots of rock and ballads to match the high school theme. With the cliques, Gentaro’s pompadour, the music and the opening singing about burgers, it’s hard not to get drawn in by their merging of American and Japanese culture. That, coupled with the wonderful supporting cast, might be what saves the show because it otherwise lacks more interesting themes. Yes, I did speak about themes such as “fear of adulthood” and “friendship” but those themes become trite fast. This is a show with 48 episodes to its name so the constant recycling of these themes start to hurt a bit towards the end. Had the big twist of the show come earlier, the second half of the series could’ve easily focused on this instead, but that would require asking the viewer to think a whole bunch about God and the origin of the universe and such fun stuff. Honestly, the big twist near the end was what ultimately saved the series from ending on a rather dull note since I had since long grown tired of the villains at that point and it felt more like mopping up than wrapping up. It goes on for just a few episodes too long and it really could’ve benefited from being axed a few weeks earlier. This also would’ve forced them to streamline the series considerably and it could’ve avoided a lot of the “monster of the week” episodes that plagues the middle of the series. But then the big twists comes and I’m hooked right in again but it never really goes anywhere. And that amuses me. They’re willing to discuss themes we normally would’ve reserved for shows for teenagers or even adults but then they chicken out in the last minute and goes for a sugar coated ending. Especially on the coattails of OOO that had the biggest, saddest ending ever. But then again, that might be what ultimately made them go with that ending. Why those two darn boys just didn’t admit they loved each other I will never, ever know. Oh, right… Japan. But despite all that, I still enjoyed it greatly. Sure, it stumbled and it’s not necessarily the deepest Kamen Rider ever nor will it really figure in my top five but it’s memorable simply because of its delicious setting and its overall comedic tone. It’s very light hearted, to a fault at times, but perhaps it was exactly what the doctor prescribed after the gut-wrencher that was OOO. I plowed through the series relatively quickly and once you picked it up it was almost impossible to put back down again. If you’re willing to let yourself be a kid with no worries again, then it’s a lot of fun. What’s up next for this blog? Not sure, we’ll see but I’m guessing we might be seeing some Doctor Who on here in a while and maybe some other stuff as well. But first up? Space Sheriff Gavan.